It’s hard to believe that Valentine’s Day is just around the corner. This holiday fits beautifully into literacy development with young children from sharing some very lovely books to creating your own valentine messages. 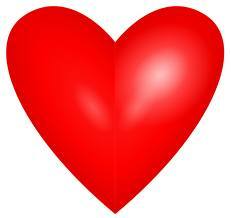 This week we are going to explore some great books that are centered around love, sharing and caring. Next Monday, I will share a variety of valentine cards to make with your youngsters. So, let’s get started! 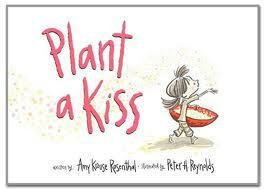 Plant a Kiss by Amy Krouse Rosenthal and illustrated by Peter Reynolds is a beautiful simple story of a little girl who plants a kiss, nurtures it and then shares it. What a sweet message of the power of tending to something and then sharing its bounty. 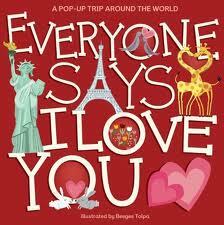 Everyone Says I Love You by Beejee Tolpa is a fun pop-up book that teaches you how to say, “I love you!” around the world. The book travels to Kenya, France, Italy, Holland and other locations. 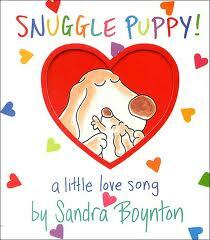 Snuggle Puppy by Sandra Boynton is a board book for the younger crowd. I absolutely love reading/singing this love song to my one-year old son. “Snuggle puppy of mine. everything about you is especially fine. I love what you are. I love what you do. Oooo, fuzzy snuggle puppy of mine. I love you.” You can even visit Sandra Boynton’s website to listen to the little love song which is on her Philadelphia Chickens cd. 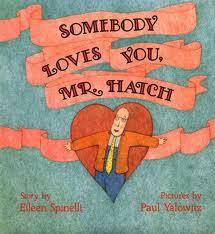 Somebody Loves You, Mr. Hatch by Eileen Spinelli and Paul Yalowitz tells the story of a man who receives an anonymous valentine that changes his perspective on life and he in turn becomes more sociable and positive. 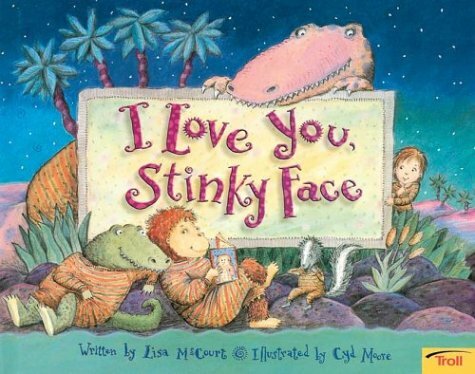 I Love You Stinky Face by Lisa McCourt and Cyd Moore is a silly romp between a mother and her child in which the mother states over and over that she will love her child under any circumstances. 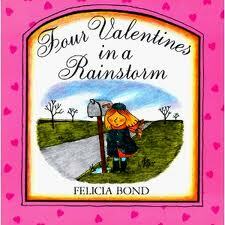 Four Valentines in a Rainstorm by Felicia Bond is the story of Cornelia Augusta (such a great character name) who begins to catch raining hearts one day and then crafts them into special valentines for her many acquaintances. This is the perfect story to lead into your own valentine card making activity. Stay tuned when next Monday we will expand on Four Valentines in a Rainstorm with four creative valentine making ideas to promote writing development. Nice selection of books for Valentines Day. Since I have grown kids, I almost forgot it was nearly that time. Everyone Say I Love You, sounds very special.